The intersection of Main Street and High Street in downtown Belfast. Shops line Main Street in downtown Belfast. 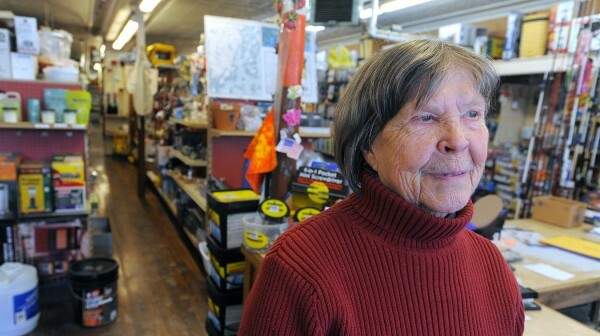 Eunice Palmer is the owner of the Home Supply Center hardware store on Main Street in Downtown Belfast. Palmer said that she likes the way the town has changed, and believes that it is better then it was 40 or so years ago when she started the business. The Belfast Army-Navy store on Main Street in downtown Belfast is closing after two decades in business, with the storefront space to become a locally-owned Christmas shop. Though owner Ronald Mullen said it's just time for him to retire and travel, others in the community are concerned about what they see as increasing gentrification of the city. Main Street in downtown Belfast. 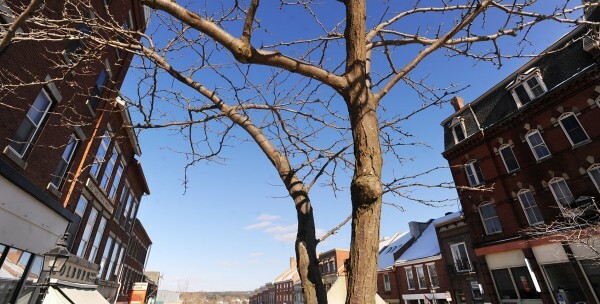 BELFAST, Maine — Located right next to a gleaming speciality olive oil, vinegar and wine shop and two doors down from a $300-per-night boutique hotel, the Belfast Army-Navy store on Main Street seems like a holdout from a different, grittier time. On Tuesday, men wearing Carhartt coveralls picked through the racks of balaclavas and outdoor gear. Machetes and knives were kept under plexiglas at the front counter and the windows featured an eclectic display of mannequins wearing scouting uniforms and second-hand musical instruments. Everything was on sale, because at the end of April the store will close and be reopened as a Christmas shop. He was quick to reassure his customers that he was looking out for them as he prepares to retire. The new Christmas shop will continue to sell scouting uniforms and supplies and the Home Supply Center will stock paintball gear. But still, the change is worrisome to some locals, who fear that the city may be embracing too much gentrification too quickly, especially after watching another Main Street institution, Weaver’s Bakery, close this winter after nearly 60 years in business. The storefront, where the coffee-drinking crowd of regulars gathered in early mornings for decades to shoot the breeze and discuss city and national politics, will reopen as an environmental consulting firm. 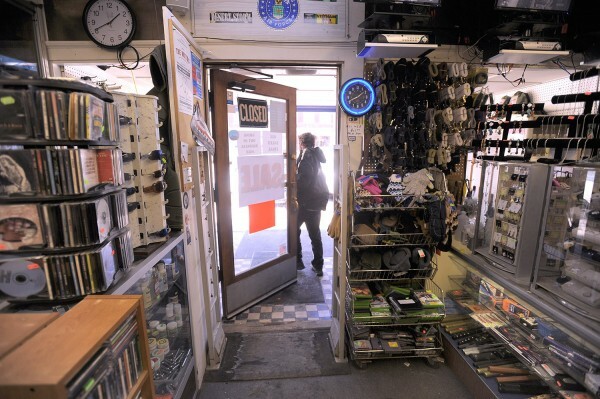 Helen Sahadi, who owns Heavenly Socks Yarns, said that the same day she learned of the Army-Navy store’s closing, she looked into expanding into a newly-renovated storefront space. When she heard the price — $2,500 a month — she was dumbfounded. Usual rents downtown range around $1,200. Some in the former chicken factory town on the Passagassawakeag River wondered if the increased prosperity and tourism meant that their community was going to start looking like Camden, a longtime New England travel destination. That town is located just 18 miles south on U.S. Route 1, but in many ways, Camden and Belfast have historically been worlds apart. Becoming more like Camden, to many in Belfast, means having an abundance of beautiful gift shops but perhaps a diminishment of blue-collar soul. Breanna Pinkham Bebb of the civic organization Our Town Belfast said that every community will always face change. She said that her organization has an economic restructuring committee which looks at assessing the mix of downtown businesses, and when vacancies occur, to be aware of what the community needs. “I hope that Belfast stays affordable for everyone,” she said. 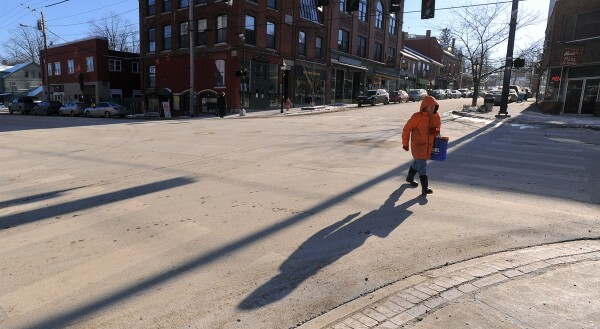 But the town’s gentrification — if that’s what to call it — has many upsides, locals say. Downtown looks very different than it did just five years ago, when an abundance of empty storefronts worried local boosters. Palmer said she appreciates that more people are choosing to live in the second and third floors of the downtown buildings. Colby Horne, who will be the fourth generation of his family to run Colburn Shoe, said that there’s much more to do since he went to high school here 12 years ago. Susan Woods, the owner of Vinolio, grew up in Belfast. The economy has definitely changed enough to support her olive oil, vinegar and specialty food shop, she said, but not everything is different.